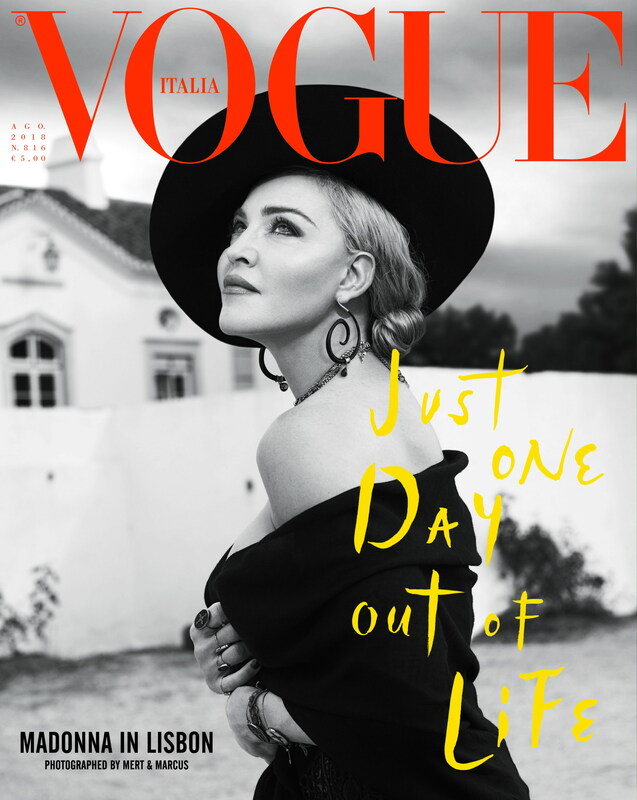 A fashion shoot and interview with Madonna appear in the August issue Vogue Italia, marking her 60th birthday. 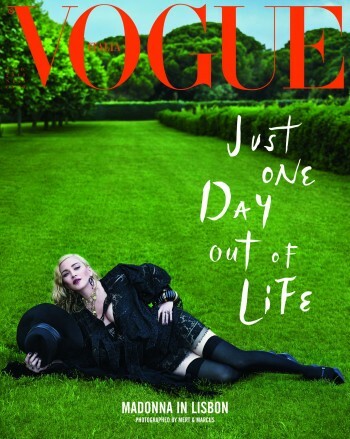 The shoot is called “Just one Day out of Life,” and Madonna on the two available covers and posters wears all-black Saint Laurent looks, posing at the Herdade do Peru estate, which dates back to the 18th century, and is located in the national Park of Arrábida, about 19 miles from Lisbon. The magazine initially planned to mark Madonna’s 60th birthday in August with a celebration of her career and accomplishments, but it turned out she had a very different plan. Vogue Italia creative director Giovanni Bianco told WWD in an exclusive interview..
She doesn’t want to talk about the past. She is in an incredibly hard worker, I have learned so much from her intensity and dedication, but I think there is a distinction between her popular image and the day-by-day, normal person. In this shoot, you see more of her maternal side, she is fascinating with her children and friends – she is an example. She is very happy and romantic at the moment, and you can see it in the photos, where she poses with all that she loves the most. She is a friend but I am also a fan, and my thoughts went straight to the collectible poster. She knows the musicians there, it’s like a laboratory, there’s music from Cabo Verde and she loves fado [a Lisbon-based music genre]. She basically did her own styling. It’s the tale of a new life, her move to Portugal to help her son David play soccer—it’s incredible to think of Madonna as a soccer mom. She proposed the Lisbon angle and it turned out to be a very personal interview, more interesting than doing a retrospective of the artist or a story on her African projects, which have already been explored. Madonna is working on her next album and it’s safe to say that this music will infuse her work. The issue hits newsstands on August 3.